When I was a youngster, I remember seeing soap commercials for Irish Spring, which featured hairy-chest man working up a good lather. I even remember my father working up a good one before he shaved. If it lathered, it must be doing something, right? As I got older and could afford to pay attention to my grooming regimen one of the first questions I asked was about how it lathered. The takeaway from these moments was that it is all about the lather, or so I thought. Portland General Store recently introduced me to their no foam Organic Racer Shave Cream. I will admit I was very skeptical. I’ve tried other shaving creams using natural ingredients and they just haven’t worked for me. For one, no matter how hard I tried they didn’t lather or coat my face well and after the first pass, I needed to go back for more to keep my face slick enough to avoid cutting myself. That said I was in shock the first time I used PGS’s Racer Shave Cream. With each stroke I couldn’t believe what I was seeing and feeling. Could it be my lathering requirement was null and void? Could it be I found a natural shave cream that has me jumping ship from some of the market leaders? YES INDEED! For starters, I got over the no foam thing from day one. PGS’s Racer Shave Cream coats the face very well. I find that using my hand works better than my brush. A two-finger dollop was all I needed. The best part, you don’t need any more for a second or third pass. The oils the cream uses leaves the skin slick and the application of a little water is all that’s needed to keep that going. As for the shave, it’s super smooth and very close. My double-edged safety razor glides across my skin with ease. The end result, my skin hasn’t felt this good post shave in a long time. It feels new and hydrated. Another attribute I find attractive about PGS’s Racer Shaving Cream is its scent. Slightly spiced, creamy and woody it’s intoxicating and all man. A list of ingredients are on PGS’s website and a jar will run you $36. A sample for PGS’s Racer Shave Cream was sent to me prior to this review. It in no way influenced my opinion. This entry was posted in Product review and tagged All Natural Grooming Products, Men's grooming, mens grooming products, Natural Shaving Products, Organic Grooming Products, Organic Shave Cream, Organic shaving products, Portland General Store, Racer Shave Cream, Shaving Cream, shaving supplies, Skin Care, wet shave supplies. Bookmark the permalink. It is always great to hear your experiences and discoveries with fragrances Barney. Your writing feels like as we were speaking in person. Miss you! Wow. I got a sample of this at Elements.. and everything you said is en pointe. Hey Ron, I’m so glad to hear this. It really is an awesome shave cream. Thanks for sharing. Good seeing you at Elements. That price is a steal. 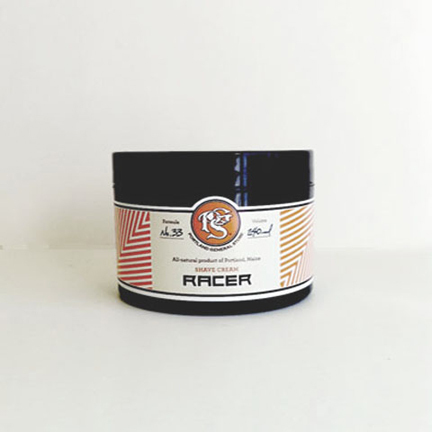 Do let me know what you think of the Racer Shave Cream after you’ve had a chance to use it.